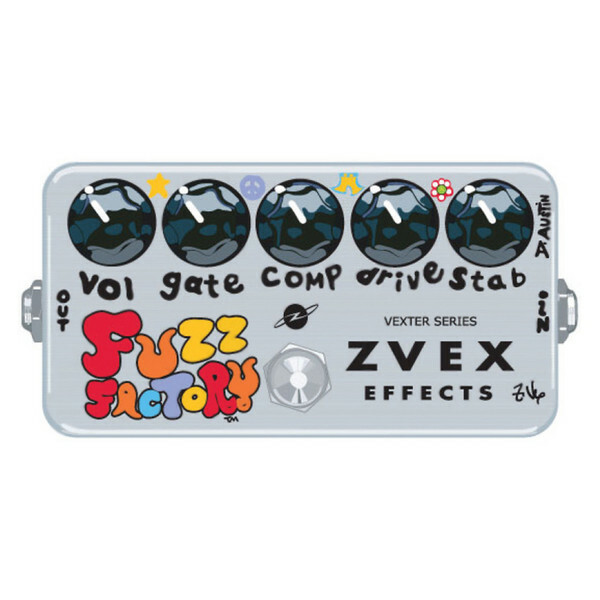 The Z.Vex Vexter Fuzz Factory is identical in construction to the newest hand-painted Fuzz Factories, including a DC power jack and on/off LED indicator. This VEXTER Pedal is hand silk-screened instead of hand-painted, otherwise it is identical to the hand painted versions. This is a five-knob fuzz using two new old-stock sixties germanium transistors. Although the five knobs are named for the parameters over which they seem to have the most control. They are controls for various operating levels and biases, and basically shape you a personalized fuzz. Please Note: The unit demonstrated in this video is the Hand Painted version of the FUZZ FACTORY, the VEXTER version offered here is exactly the same pedal only not hand painted. Gate: Squelches noise after end of sustain. Turning to the right eliminates squeals, hiss and buzz, stopping just as they disappear, or use to tune in exact feedback pitch. Turning to left opens gate. Compress: Adds attack characteristic when turned to left, which gets softer to right, and suddenly pinches tone when all the way right. Also use to tune in fat feedbacky fuzz. Drive: Increases distortion when used as a "normal" fuzz, and adjusts feedback pitch and tonal thickness. Stability: Use all the way right. Do not attempt to adjust this control below 2:00, unless you like your fuzz soft and squishy. Use to control feedback pitch. Power Consumption: Z. Vex pedals use as low a current as possible, which considerably extends battery life. The 'On' current is less than 3 mA... compared to the Tube Screamer at almost 40 mA.